Inicio/Spanish Language/23rd Edition of DRAE is out! Does this word exist in Spanish? Our students on www.spanishviaskype.com often ask this question to us. Maybe one of them tried to search some word into RAE’s dictionary application on www.rae.es and couldn’t find it. 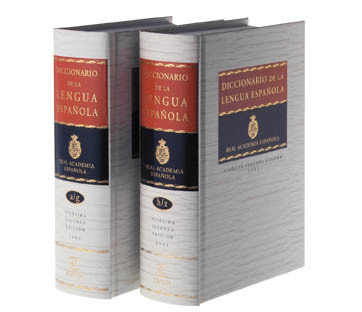 Are all Spanish words included in the Diccionario de la Real Academia Española (RAE)? Of course, not. RAE collects words in use and removes the less used ones. Last Thursday, the 23rd edition of this dictionary was released and we bring you today all the news about it. 1. Words about new technologies: Internet and computers are one of the biggest sources of neologisms in Spanish. Red social (Social network), tuitear, tuit or tuiteo, from the well known Twitter, Wifi, intranet or nube (cloud, as a data storage system) has been added to this new edition. However, we wonder if Spanish speakers will actually use the phonetics adaptation for words like tuit or they will prefer the original one, “tweet”. We must remember that güisqui never won its battle against “whisky”. 2. Social Reality: The society has changed, not only the technologies, but also the people, and RAE has included new concepts in the dictionary: homoparental (a family whose parents are homosexual) and new definitions for marido (husband), now a man married to a spouse, not just to a wife, and yerno (son in law), now a daughter or son’ husband, not just the daughter’s husband. 3. Colloquial words: Now we can find in the dictionary words that we’ve been using with our friends of relatives for a long time, such as amigovio, a mix of amigo and novio (friend and boyfriend), birra (beer), botellón (a large group of young people drinking in the street), gorrilla (a person who helps drivers to park their car in exchange for some tip) or papichulo (a hot man). So, although since last Thursday you can find this new edition in the bookshops, remember that language is made by speakers, and it evolves constantly. The words you can’t find in it now, you might find them in future editions. If you want to learn these new words, you can reserve a free trial lesson here.